An incredible tranformation is taking place at 84 Dock Jemmapes-Hive is a being born! Driven by a dynamic team of creative professionals in architecture, eco-design design and ergonomics of workspaces, metamorphosis takes shape day after day. Brainstorming and world cafes have helped to give concrete substance to the vision of space, from requirements gathered from entrepreneurs by Michele Caleffi, of Ecolutions, coordinator of the opening of the premises. Above, Michael Heurtevant, Jeremiah Noizette (architects) and Katia Gloger (design). a logbook showing the construction of the Hive and the path that led to its physical design and ergonomics in ecological terms is being prepared to explain the decisions taken s and encourage others to follow a similar process. 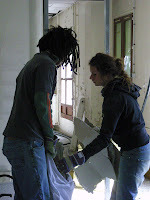 architectural interns come to discover the ecological approach of La Ruche (above) ... and lend a hand! The Beehive is about to open its first wing mid-May 2008, and will host a score of entrepreneurs: Ashoka, Mozaik HR & Skills Gateways and Clubs Business Integration (CREP) and the small team of La Ruche. The latter has just welcomed its Project Manager, who will soon appear on the blog and in person. Dice mid-May, she will coordinate work spaces and the daily management of La Ruche. For the "second batch" of entrepreneurs, A steering committee will be set up in May to decide on entering the hive ... remember to express your needs so that they are taken into account. Someone will contact you to formalize your interest as soon as the first wing is open. Questions, encouragement, rants, favorites? Go ahead, it's spring, let yourself go, write us, as usual! And happy to share further in the very near future ... to advance the machine together!